Just three years after crayfish were introduced to a B.C. lake, two species of fish that had existed in the lake for thousands of years were suddenly extinct. But it's what took their place that has scientists fascinated. New research from UBC shows that when humans speed up the usually slow process of evolution by introducing new species, it can result in a lasting impact on the ecosystem. The phenomenon is known as reverse speciation and researchers witnessed it in Enos Lake on Vancouver Island where two similar species of threespine stickleback fish disappeared within three years. "When two similar species are in one environment, they often perform different ecological roles," said Seth Rudman, a PhD student in zoology at UBC. "When they go extinct, it has strong consequences for the ecosystem." 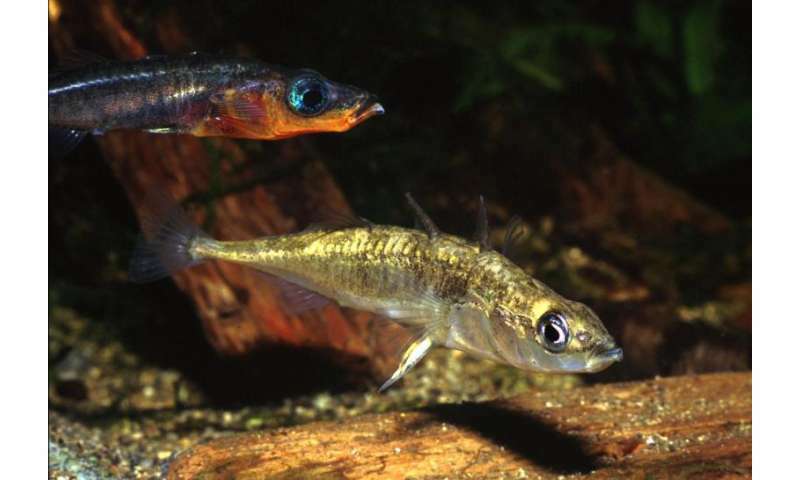 Two species of endangered threespine stickleback fish lived in the lake. One lived in the middle of the lake and ate mostly zooplankton while the other lived closer to the shore, eating insects that spent their larval stage in the water. In the mid-1990s, crayfish were introduced to the lake. Between 1994 and 1997, researchers documented how both species disappeared as a result of interbreeding, leaving only a hybrid species. In this study, published recently in Current Biology, researchers document how the shift from two distinct species to one hybrid species has impacted the ecosystem. The new stickleback fish does not perform all of the functions as its predecessors. The hybrid spends more time near the shore of the lake and eats more large insects. As a result, the number of small insects coming out of the lake has increased, showing how the changes in the lake can also cause changes to the terrestrial ecosystem. With the new hybrid, researchers have also found that the leaves that fall into the lake do not decompose as quickly. Rudman and co-author Dolph Schluter, a professor in UBC's department of zoology, said this is just one example of reverse speciation and that it is becoming a more common phenomenon, particularly in environments that have been altered by humans. They also say Canada is at greater risk for these events because "young species" are prone to reverse speciation. "Much of Canada's biodiversity, particularly fish in lakes and rivers, are considered to be 'young' species that formed in the last 12,000 years or so," said Rudman. "This type of evolution, known as reverse speciation, happens remarkably quickly and can cause alterations to the ecology of the ecosystem. It means we need to consider evolution in our conservation efforts." Extinction does not seem to be the right word, if the two species hybridized to create a new specie. Also,It would be interesting to see a follow-up genomic study to see if their genetic diversity really reduced, or a study to see if the hybrid specie may speciate readily back into the two previous species. The article never explained the crayfish factor except for them being "introduced". What factor did crayfish play where in two separate Stickleback species started interbreeding leaving only a hybrid species of the original two?